Claypot Chicken Rice (Chinese: 砂煲鸡饭, 瓦煲鸡饭 or 煲仔鸡饭) is a dish that is both convenient and tasty. Traditionally, Claypot Chicken Rice is cooked over a charcoal stove, giving the dish a distinctive flavour. It is a one-pot meal and is usually cooked in the southern regions of China, Malaysia and Singapore. Due to the time-consuming method of preparation and slow-cooking in a clay pot, customers typically have to wait for 15-30 minutes before the dish is ready. Since not everyone owns a clay pot, I will be using a conventional rice cooker. This is a simpler and faster method that barely compromises the taste. 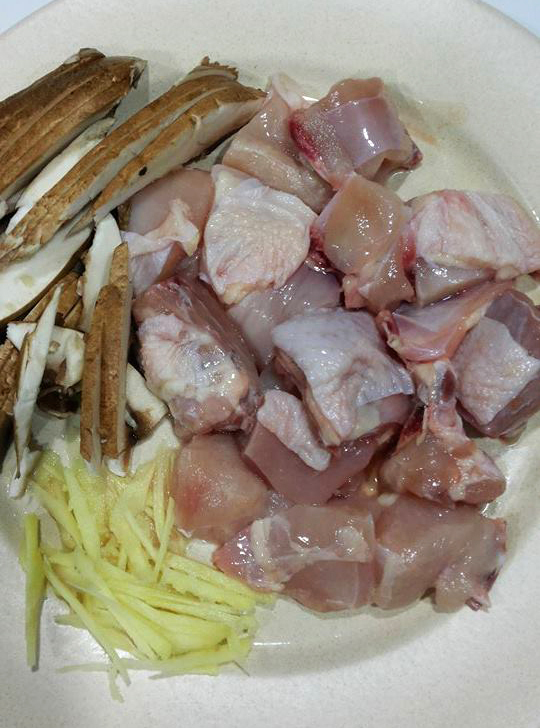 Cut the chicken meat into thin slices and rinse. Mix Group A in a bowl and then pour it into the chicken and mushrooms. Leave it to marinate for at least 2 hours in the fridge. TIP: The longer you marinate it, the tastier the chicken. Cut the salted fish into small strips or pieces. Use MEDIUM heat to deep fry the salted fish until it becomes golden brown and crispy. In a frying pan, put a few tablespoons of cooking oil and stir fry the Chinese sausage for a few minutes under MEDIUM heat. *Note that this step is optional. Personally, I think that this step enhances the flavour of the Chinese sausages. Take the mushrooms out of the chicken marinate. Using HIGH heat, use the same oil to stir fry the mushrooms, chopped onions/shallots, and the white portion of the spring onions until fragrant. In the meantime, use some hot water to dissolve the chicken stock cube and set aside. When the shallots and mushrooms are fragrant, add in the washed rice. Stir fry for 2-3 minutes. Add Group B to the rice. Stir fry for 2-3 minutes until the rice are evenly coated with the seasoning. Transfer the rice mixture into the rice cooker and add in the dissolved chicken stock and enough water for the amount of rice you have (as illustrated on the rice packaging). TIP: As the rice has already been soaked, you may want to reduce the water slightly so that it won’t be soggy. Cook in the conventional rice cooker using the normal rice cooking function. If you’re in a rush, cook using the “Quick Cook” function. Open your rice cooker at about 2/3 of the rice cooking cycle, to check if there are bubbles in the rice and water has started to reduce. Now put in the deep fried salted fish, chicken strips and Chinese sausages on top of the half cooked rice. Re-cover the rice cooker until it indicates that the rice is cooked. Let it rest for 10-15 minutes before serving. *When the rice cooker function is off, the steam will continue to cook the chicken meat and therefore, serve only 10-15 minutes later. NOTE: Every rice cooker is different. You have to occasionally open the rice cooker to check the progress of the cooking. For example, if your rice cooker’s rice cooking function is 30 minutes per cycle, you should check the rice cooker around 20 minutes after you started cooking. Happy cooking and if you have any questions, suggestions or feedback, please leave a comment!